ਡੋਮਜ਼ਡੇ ਕਿਤਾਬ ਨੇ ਬ੍ਰਿਟਨ ਵਿਚ ਜ਼ਮੀਨ ਦੇ ਹਰ ਟੁਕੜੇ ਅਤੇ ਹਰ ਇਕ ਜਾਨਵਰ ਨੂੰ ਰਿਕਾਰਡ ਕੀਤਾ: "ਇਕ ਵੀ ਜਗ੍ਹਾ ਛੁਪਣ ਲਈ ਨਹੀਂ ਸੀ, ਨਾ ਹੀ ਜ਼ਮੀਨ ਦਾ ਕੋਈ ਯਾਰਡ, ਨਹੀਂ, ਇਸ ਤੋਂ ਇਲਾਵਾ ... ਨਾ ਇਕ ਵੀ ਬਲਦ, ਨਾ ਇਕ ਵੀ ਗਊ, ਨਾ ਹੀ ਕੋਈ ਸੂਰ ਬਚਿਆ ਜੋ ਕਿ ਬਾਦਸ਼ਾਹ ਦੀ ਲਿਖਤ ਵਿਚ ਨਹੀਂ ਸੀ ਦਿੱਤਾ ਗਿਆ।"" ਮਿਸਾਲ ਦੇ ਤੌਰ ਤੇ, ਬਰਕਸ਼ਾਇਰ ਵਿਚ ਅਰਲੇ ਦਾ ਸ਼ਾਹੀ ਮਹਿਲ, ਜੋ ਕਿ ਕਿਤਾਬ ਵਿਚ ਦਰਜ ਹਜ਼ਾਰਾਂ ਪਿੰਡਾਂ ਵਿਚੋਂ ਇਕ ਸੀ, ਵਿਚ 1086 " ਅਤੇ 6 ਡੀ [ਹਰ ਸਾਲ] ਅਤੇ [ਪਸ਼ੂਧਨ ਲਈ] 20 ਏਕੜ ਜ਼ਮੀਨ ਦੇ ਮਾਲੀਏ ਲਈ 2 ਮੱਛੀ ਪਾਲਣ। 70 ਫੀਡ [ਫੀਡਿੰਗ] ਲਈ ਵੁਡਲੈਂਡ।""
↑ ਕਲਟਨ-ਬਰੌਕ, Juliet (1999). ਘਰੇਲੂ ਜੀਵਾਂ ਦਾ ਕੁਦਰਤੀ ਇਤਿਹਾਸ. Cambridge University Press. pp. 1–2. ISBN 978-0-521-63495-3. ↑ 2.0 2.1 2.2 2.3 2.4 "History of the domestication of animals". Historyworld. Retrieved 3 June 2017. ↑ ਨੈਲਸਨ, Sarah M. (1998). ਸੂਰਾਂ ਦੇ ਪੂਰਵਜ. Pigs in prehistory. University of Pennsylvania Museum of Archaeology and Anthropology. ↑ Ensminger, M.E. ; Parker, R.O. (1986). ਭੇਡ ਅਤੇ ਬੱਕਰੀ ਵਿਗਿਆਨ (Fifth ed.). Interstate Printers and Publishers. ISBN 0-8134-2464-X. ↑ Adler, Jerry; Lawler, Andrew (1 June 2012). "How the Chicken Conquered the World". Smithsonian Magazine. Retrieved 5 June 2017. ↑ Sapir-Hen, Lidar; Erez Ben-Yosef (2013). "The Introduction of Domestic Camels to the Southern Levant: Evidence from the Aravah Valley" (PDF). Tel Aviv. 40: 277–85. doi:10.1179/033443513x13753505864089. ↑ Manuelian, Peter der (1998). Egypt: The World of the Pharaohs. Cologne, Germany: Könemann. p. 381. ISBN 3-89508-913-3. ↑ Nicholson, Paul T. (2000). Ancient Egyptian Materials and Technology. Cambridge, UK: Cambridge University Press. p. 409. ISBN 0-521-45257-0. ↑ Clutton-Brock, Juliet (1981). Domesticated animals from early times. Heinemann. p. 145. ↑ O'Connor, Terry (30 September 2014). "Livestock and animal husbandry in early medieval England". Quaternary International. 346: 109–18. doi:10.1016/j.quaint.2013.09.019. ↑ "The Anglo-Saxon Chronicle". Translated by Giles, J. A.; Ingram, J. Project Gutenberg. 1996. ↑ "Interpreting Domesday". The National Archives. Retrieved 26 May 2017. ↑ "The progress of farming in Medieval Europe". History of Agriculture. University of Reading. Retrieved 28 May 2017. ↑ Campbell, Bruce M. S.; Overton, M. (1993). "A New Perspective on Medieval and Early Modern Agriculture: Six Centuries of Norfolk Farming, c.1250-c.1850". Past and Present. 141: 38–105. doi:10.1093/past/141.1.38. ↑ Crosby, Alfred. "The Columbian Exchange". History Now. The Gilder Lehrman Institute of American History. Retrieved 28 May 2017. ↑ "Robert Bakewell (1725–1795)". BBC History. Retrieved 20 July 2012. ↑ "English Longhorn". 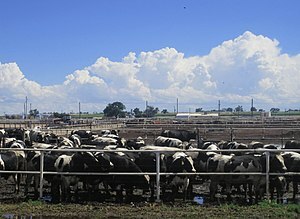 The Cattle Site. Retrieved 26 May 2017. ↑ Pykala, Juha (2000). "Mitigating Human Effects of European Biodiversity Through Traditional Animal Husbandry". Conservation Biology. 14 (3): 705–12. doi:10.1046/j.1523-1739.2000.99119.x. ↑ 21.0 21.1 Webster, John (2013). Animal Husbandry Regained: The Place of Farm Animals in Sustainable Agriculture. Routledge. pp. 4–10. ISBN 978-1-84971-420-4. ↑ Blench, Roger (17 May 2001). 'You can't go home again' – Pastoralism in the new millennium (PDF). London, UK: Overseas Development Institute. p. 12. ↑ Starrs, Paul F. (2000). Let the Cowboy Ride: Cattle Ranching in the American West. JHU Press. pp. 1–2. ISBN 978-0-8018-6351-6. ↑ Levinson, David; Christensen, Karen (2003). Encyclopedia of Community: From the Village to the Virtual World. Sage. p. 1139. ISBN 978-0-7619-2598-9. ↑ Rebanks, James (2015). The Shepherd's Life. Penguin: Random House. p. 286. ISBN 978-0141-97936-6. ↑ Silbergeld, Ellen K; Graham, Jay; Price, Lance B (2008). "Industrial food animal production, antimicrobial resistance, and human health". Annual Review of Public Health. 29: 151–69. doi:10.1146/annurev.publhealth.29.020907.090904. ↑ Blount, W.P. (2013). Intensive Livestock Farming. Elsevier. pp. 360–62. ISBN 978-1-4831-9565-0. ↑ Dryden, Gordon McL. (2008). Animal Nutrition Science. CABI. pp. 1–3. ISBN 978-1-78064-056-3. ↑ Attenborough, David (1984). The Living Planet. British Broadcasting Corporation . pp. 113–14. ISBN 0-563-20207-6. ↑ United States. Agricultural Research Service. Animal Husbandry Research Division (1959). Hay crop silage. ↑ Dryden, Gordon McL. (2008). Animal Nutrition Science. CABI. pp. 16–19. ISBN 978-1-84593-412-5. ↑ 34.0 34.1 "What farm animals eat". Food Standards Agency. Retrieved 18 May 2017. ↑ 35.0 35.1 35.2 Turner, Jacky (2010). Animal Breeding, Welfare and Society. Routledge. p. Introduction. ISBN 978-1-136-54187-2. ↑ Jarman, M.R. ; Clark, Grahame; Grigson, Caroline; Uerpmann, H.P. ; Ryder, M.L. (1976). "Early Animal Husbandry". The Royal Society. 275 (936): 85–97. doi:10.1098/rstb.1976.0072. ↑ "Farmers". European Platform for the Responsible Use of Medicines in Animals. 2010. Retrieved 18 May 2017. ↑ "Classical swine fever" (PDF). The Center for Food Security and Public Health. Retrieved 20 May 2017. ↑ "Scrapie Fact Sheet". National Institute for Animal Agriculture. 2001. Retrieved 6 June 2018. ↑ "Foot-and-mouth". The Cattle Site. Retrieved 20 May 2017. ↑ "feed (agriculture) | Antibiotics and other growth stimulants". Britannica.com. Retrieved 29 April 2018. ↑ Fraser, Douglas (14 February 2017). "Scottish salmon farming's sea lice 'crisis'". BBC. Retrieved 20 May 2017. ↑ "Parasite control". Animal Health Ireland. Retrieved 20 May 2017. ↑ Norrgren, Leif; Levengood, Jeffrey M. (2012). Ecology and Animal Health. Baltic University Press. pp. 103–04. ISBN 978-91-86189-12-9. ↑ "Welcome to Equine Research, Education, and Outreach". University of Kentucky. Retrieved 18 August 2017. ↑ Ferguson, W.; Ademosun, A. A.; von Kaufmann, R.; Hoste, C.; Rains, A. Blair. "5. 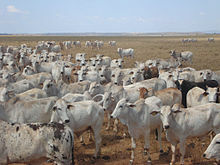 Livestock resources and management". Food and Agriculture Organization. Retrieved 24 May 2017. ↑ "Livestock Species". Texas A&M University Department of Agriculture and Life Sciences. Retrieved 24 May 2017. ↑ Steinfeld, H.; Mäki-Hokkonen, J. "A classification of livestock production systems". Food and Agriculture Organization. Retrieved 24 May 2017. ↑ Myers, Melvin L. "Chapter 70 – Livestock Rearing". Encyclopaedia of Occupational Health and Safety. Retrieved 24 May 2017. ↑ Unklesbay, Nan (1992). World Food and You. Routledge. pp. 179ff. ↑ Walling, Philip (2014). Counting Sheep: A Celebration of the Pastoral Heritage of Britain. Profile Books. p. 16. ISBN 978-1-84765-803-6. ↑ Leenaars, Marlies; Hendriksen, Coenraad F. M. (2005). "Critical Steps in the Production of Polyclonal and Monoclonal Antibodies: Evaluation and Recommendations". ILAR Journal. 46 (3): 269–279. doi:10.1093/ilar.46.3.269. ↑ Godinho, Denise. "Animal Husbandry in Organic Agriculture". Food and Agriculture Organization. Retrieved 25 May 2017. ↑ 56.0 56.1 "Dairy animals". 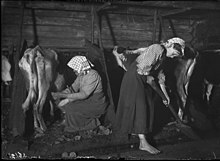 Dairy production and products. FAO. Retrieved 23 May 2017. ↑ "Breeding". Dairy production and products. FAO. Retrieved 23 May 2017. ↑ "Housing in a zero grazing system" (PDF). Republic of Kenya: Ministry of Livestock Development. Retrieved 5 June 2017. ↑ Aherne, Frank; Kirkwood, Roy (16 February 2001). "Factors Affecting Litter Size". The Pig Site. ↑ Gregory, Neville G.; Grandin, Temple (2007). 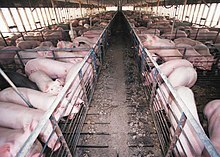 Animal Welfare and Meat Production. CABI. pp. 1–2. ISBN 978-1-84593-216-9. ↑ Miller, G. Tyler; Spoolman, Scott (2014). Sustaining the Earth. Cengage Learning. p. 159. ISBN 978-1-285-76949-3. 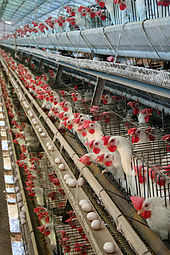 ↑ "About egg laying hens". Compassion in World Farming. Retrieved 26 May 2017. ↑ "Growing meat chickens". Australian Chicken Meat Federation. 2013. Retrieved 26 May 2017. ↑ "Duck". Poultry Hub. Retrieved 26 May 2017. ↑ "Global Aquaculture Production". Fishery Statistical Collections. Food and Agriculture Organization of the United Nations. Retrieved 26 May 2017. ↑ "Fish culture in rice fields". Fishery Statistical Collections. Food and Agriculture Organization of the United Nations. Retrieved 26 May 2017. ↑ Mosig, John; Fallu, Ric (2004). Australian Fish Farmer: A Practical Guide to Aquaculture. Landlinks Press. pp. 25–28. ISBN 978-0-643-06865-0. ↑ "Ancient Egypt: Bee-keeping". Reshafim.org.il. 6 June 2003. Retrieved 22 May 2017. ↑ "Fixed combs". Bees for Development. Archived from the original on 18 May 2011. Retrieved 22 May 2017. ↑ Jabr, Ferris (1 September 2013). "The Mind-Boggling Math of Migratory Beekeeping". Scientific American. Retrieved 22 May 2017. ↑ Barber, E. J. W. (1992). Prehistoric textiles: the development of cloth in the Neolithic and Bronze Ages with special reference to the Aegean. Princeton University Press. p. 31. ISBN 978-0-691-00224-8. ↑ Hill, Dennis S. (2012). The Economic Importance of Insects. Springer Science & Business Media. pp. 21–22. ISBN 978-94-011-5348-5. ↑ 74.0 74.1 Six-legged Livestock: Edible insect farming, collection and marketing in Thailand (PDF). Bangkok: Food and Agriculture Organization of the United Nations. 2013. ISBN 978-92-5-107578-4. ↑ Mekonnen, Mesfin M.; Hoekstra, Arjen Y. (2012). "A Global Assessment of the Water Footprint of Farm Animal Products" (PDF). Water Footprint Network. ↑ Whitford, Walter G. (2002). Ecology of desert systems. Academic Press. p. 277. ISBN 978-0-12-747261-4. ↑ Monteny, Gert-Jan; Andre Bannink; David Chadwick (2006). "Greenhouse Gas Abatement Strategies for Animal Husbandry, Agriculture, Ecosystems, and Environment". Agriculture, Ecosystems, and Environment. 112 (2–3): 163–170. doi:10.1016/j.agee.2005.08.015. Retrieved 5 June 2013. ↑ Grandin, Temple (2013). "Animals are not things: A view on animal welfare based on neurological complexity" (PDF). Trans-Scripts 3: An Interdisciplinary Online Journal in Humanities And Social Sciences at UC Irvine. Archived from the original (PDF) on 19 August 2014. ↑ Hewson, C. J. (2003). "What is animal welfare? Common definitions and their practical consequences". The Canadian Veterinary Journal. 44 (6): 496–99. PMC 340178 . PMID 12839246. ↑ Broom, D. M. (1991). "Animal welfare: concepts and measurement". Journal of Animal Science. 69 (10): 4167–75. PMID 1778832. ↑ Garner, R. (2005). Animal Ethics. Polity Press. ↑ Regan, T. (1983). The Case for Animal Rights. University of California Press. ↑ Johnson, Ben. "John Bull". Historic UK. Retrieved 26 May 2017. ↑ 89.0 89.1 Hoult-Saros, Stacy E. (2016). The Mythology of the Animal Farm in Children's Literature: Over the Fence. Lexington Books. pp. 18–29. ISBN 978-1-4985-1978-6. ↑ "Livestock in literature". Compassion in World Farming. 1 October 2015. ↑ Laurance, Jeremy (15 June 2010). "Children's Petting Farms Face Tough New Rules". The Independent. ↑ 93.0 93.1 Searle, Sarah (30 June 2014). "Stop Romanticizing Farms". Modern Farmer.